"No man is an island, entire of itself" (John Donne), but island species are. They have often evolved in splendid isolation over extended periods of time, without encountering the selective forces that their ancestors had to face on the mainland. With plenty of resources and no predators around, the new island home was often paradise to those few individuals that mastered the journey across the open ocean. In their new home they could occupy vacant ecological niches and evolve into the most charismatic island forms, not seen anywhere on the mainland. Island species contribute significantly to this planet’s biodiversity and genetic resources but they have come under enormous pressure since humans adopted ever more sophisticated seafaring techniques, spreading out to the most remote islands. Humans have brought with them not only their pets but also stowaway species such as rats and mice, which have wreaked havoc on fragile island ecosystems. Legend even has it that the cat of a lighthouse keeper has extirpated an entire bird species on a New Zealand island. Alexandra van der Geer tells a stirring story of lost and endangered island gems. (Upper left) A male wild Cyprus mouflon (Ovis orientalis ophion) or agrino (Image credit: Smichael21, Wikimedia Commons). 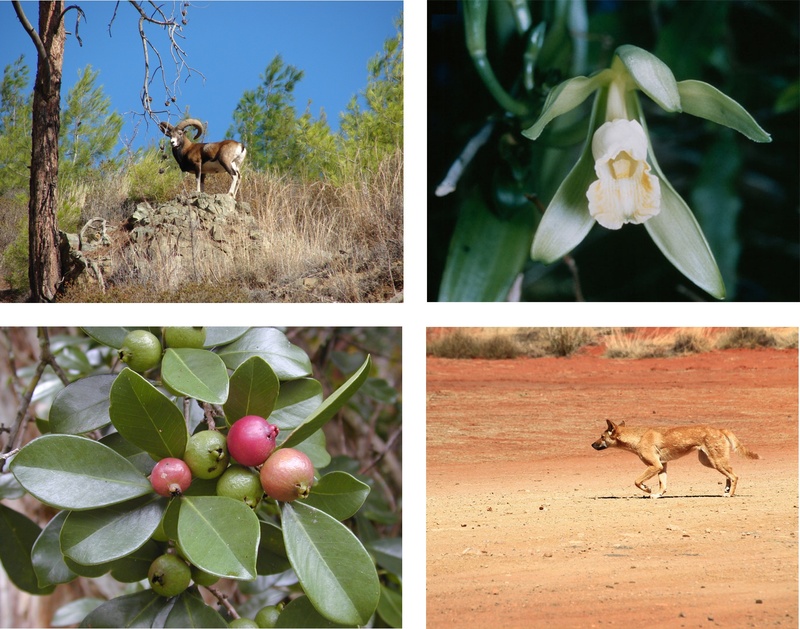 (Upper right) A flower of Vanilla planifolia, also known as Madagascar Bourbon vanilla (Image credit: US National Park Service, Wikimedia Commons). (Bottom left) Fruits of the Cattley or strawberry guava on Hawaii (Image credit: Forest and Kim Starr, Wikimedia Commons). (Bottom right) A dingo in the Australian outback (Image credit: Jacqueline Wales, Pixabay). … or so they thought. Innocent and well-intentioned these introductions may have been, but it is now clear that in many cases they had unforeseen consequences. Islands are affected disproportionally by alien species of both animals and plants. This is partly because islands generally lack the natural competitors and predators that are an integral part of an alien species' native ecosystem. Sadly, almost half of the recorded extinctions on islands since the 16th century, and virtually all of the bird extinctions on Pacific islands, have been caused by introduced species. Furthermore, there are nearly as many invasive plant species as there are native plant species on many islands. Biodiversity is obviously hit hard, but so is the economy. On a global scale, billions are spent annually to get rid of introduced species and billions more are lost due to reduced productivity or spent on the protection of native species and preventive measures. Most of these introduced species are directly beneficial to humans; they include livestock, game animals, crops, weeds, and timber. Another category of introduced species comprises those brought in for pest control, such as mongooses and snakes to catch mice and rats. In the 1930s, government entomologist Reginald Mungomery had the great idea of introducing cane toads (Rhinella marina) to Australia in an attempt to control beetle pests on sugar cane, as they had been successful elsewhere. The roots of the cane, itself an introduced crop plant, were being eaten by the grubs of native beetles and the toads were supposed to eat the grubs - but they didn't. These voracious toads (the world's largest: 10-15 cm long on average; the largest specimen measured 24 cm), which are native to Central and South America, soon went out of control. An entomologist colleague, Walter Froggatt, had already foreseen soon after the first introduction that "this great toad, immune from enemies, omnivorous in its habits, and breeding all year round, [would] become as great a pest as the rabbit or cactus." Their toxic skin and glands produce bufotoxin, a poison deadly to native and domestic animals alike. The giant toads not only feed on almost any terrestrial animal but also cause the death of predatory species that attempt to eat them. Unfortunately, this has led to a rapid decline in the northern quoll (Dasyurus hallucatus) and Mertens' water monitor (Varanus mertensi) populations. The cane toad is only one of the many examples of biocontrols that have gone horribly wrong. A cane toad in a child's hands (Image credit: reptiles4all, shutterstock). A map showing the distribution of the cane toad in Australia as of 2008 and its potential habitat on the continent (Image credit: The cane toad - an introduced species). Clearly, the introduction of exotics has often led to the extinction of native species, especially on small, isolated islands. 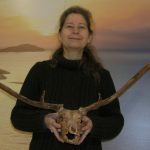 The invasive success of most alien animal species is greatly enhanced by their highly opportunistic foraging which enables them to survive on a great variety of plants and animals. Their versatile eating habits enable them to occupy all available habitats on the islands at densities that vary according to the habitat's suitability, food availability, and the presence of competitors and predators. They compete with native species for already limited resources and large herbivores also trample the native vegetation, reduce its biodiversity, and disturb the soil. Alien predators find easy prey and cats are the main offenders, accounting for 14% of modern bird, mammal and reptile extinctions on islands. Many native species evolved with no natural predators and consequently lost any anti-predator strategies such as fight and flee responses, high reproduction levels and, for birds, the ability to fly. As a result, just a few decades with alien predators around can annihilate hundreds of thousands (or even millions) of years of evolution. A sad illustration is provided by the Stephens Island wren (Traversia lyalli), a tiny flightless bird that once lived on New Zealand’s Stephens Island. In 1894, lighthouse keeper Mr. D. Lyall moved to the island and took with him his cat. The cat, named Tibbles, developed the habit of presenting its owner with wrens. Lacking any natural predators this unfortunate bird was not able to fly and its only escape was to run like a mouse, which it did very fast. It was beautifully adapted to the understorey niche of its island environment, with its flat skull, wide bill and distinctive leg bones. Lyall perceived that these birds were worth a closer investigation and gave specimens to the naturalist Henry H. Travers and he, out of curiosity, sent some to the prominent ornithologist Lord Walter Rothschild in England, who recognized them as a new species of wren. Rothschild dutifully named the species in honour of both gentlemen. However, within a year this brand new species became extinct, for which Tibbles is generally blamed but that is only part of the story. The island reportedly hosted a number of feral cats at that time, including offspring of Tibbles. In any case the first cats were introduced to Stephens Island at the beginning of 1894 and the last specimens of Traversia lyalli were presumably collected by Lyell in 1895. Searches for the bird later on did not find any evidence for the continued existence of this species. (Left) The Stephens Islands wren (Traversia lyalli) was once widespread throughout New Zealand but became extinct on both main islands following human occupation in the 13th century (Image credit: Virginia Greene). (Right) Its last refuge was on Stephens Island, in Cook Strait between North and South Islands, where it survived until 1895, the year after cats were introduced to the island (Image credit: Jonathan Reid, flickr). The lighthouse keeper, David Lyall, and his family were probably the only Europeans to ever see these flightless birds alive. Mr. Lyell reported that these wrens were scurrying around the rocks like mice and that they were so speedy that he could not get close enough to hit them with a stick or stone . Yet another category of aliens comprises those that came along uninvited. Perhaps the worst of these are rats and mice. Small and insignificant as they may seem, they have been the cause of extinctions and near extinctions of endemic or local species. Invasive rats (Rattus rattus, R. norvegicus, R. exulans) are likely to have been responsible for the greatest number of extinctions on islands. In this respect, the remote Gough Island in the middle of the southern Atlantic Ocean is the stage for a particularly nasty drama going on currently. Here, introduced house mice (Mus musculus) feast not only on carcasses and eggs, but also on live albatross chicks. These youngsters often survive but are severely wounded and face a slow, painful death due to infection and loss of blood, or a crippled adult life. "Killer mice" was the nickname these mice were given in the popular media. This abundance of high-quality food enabled the mice to grow to almost double their ancestral size within about a hundred years . A video obtained with an automatic camera on Gough Island in the South Atlantic documents invasive house mice attacking and eating alive an albatross chick in its nest at night (Video credit: Royal Society for the Protection of Birds, RSPB). Gough Island mice are no exception. On Henderson Island (Pitcairn Islands, South Pacific) the Polynesian rat (Rattus exulans) is held to have been possibly responsible for the local extinction of the sandpiper (Prosobonia sp.) and, like the mice, this rat has also doubled in size. This uninhabited island is a World Heritage site and one of the world's last two raised coral atolls with relatively unaltered ecosystems; it hosts a remarkable avian and floral biodiversity for its modest size of 37.3 km2. Chicks of two of its petrel species (Pterodroma ultima and P. neglecta) have been observed being eaten by the rats (Brooke, 1995). Invasive rats thus constitute a serious threat, perhaps worse than the infamous plastic rubbish that constantly accumulates on the island's shores, ending up in the birds' nests and in their stomachs. It is not just animals that are a problem. People are often not aware of the presence of equally costly and invincible invasive weeds. European blackberries are delicious and nutritious so why not take them along to the other side of the world? At present, this prickly weed (Rubus fruiticosus species group) has infested about 9 million hectares of land in Australia and is listed as one of the worst weeds in Australia and New Zealand. Blackberries grow vigorously with entangled canes that can be up to about 10 m long; they compete aggressively with native plants by preventing other seedlings from growing and by forming dense canopies of shade. 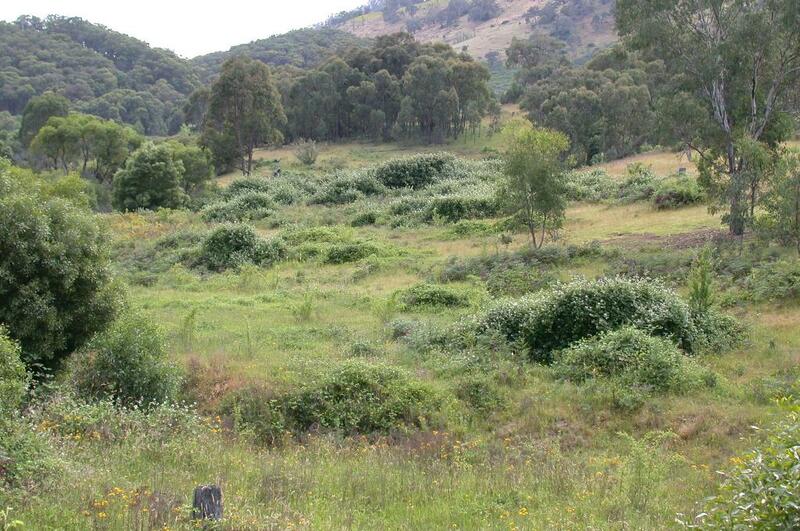 Blackberry invading the countryside in New South Wales (tall dark green clumps) (Image credit: John Hosking/State of New South Wales through NSW Department of Industry). Giant salvinia (Salvinia molesta), an aquatic fern native to Brazil, is another of the worst invasive weeds. It has escaped from garden ponds and aquaria to successfully invade lakes and ponds on islands such as Hawaii, where its thick mats block the flow of water. Needless to say, it also blocks the light and capitalizes on all available nutrients. These are the larger aliens. A complete army of microscopic aliens is also carrying out an invisible invasion of islands via people and animals on the move, ship ballast water, hull fouling, cargo containers, imported food species, plant imports, waste material, timber, and so on. The native forest birds of Hawaii, for example, now have restricted distributions due to alien diseases such as smallpox and avian malaria, brought in by a number of introduced mosquito species. These diseases are likely to have already been responsible for the extinction of many Hawaiian bird species since the first arrival of mosquitos in 1826. The Hawaii 'O'o (Moho nobilis) used to be the royal bird of Hawaii and its feathers were used as a key decorative element by the native Hawaiian nobility. Europeans were also fond of its striking plumage and thousands of birds were shot every year. However, while hunting certainly hastened its decline the principal cause of its extinction is believed to have been avian malaria, which was introduced to the Hawaiian Islands at the beginning of the 20th century. The last verified record of this species dates from 1934. 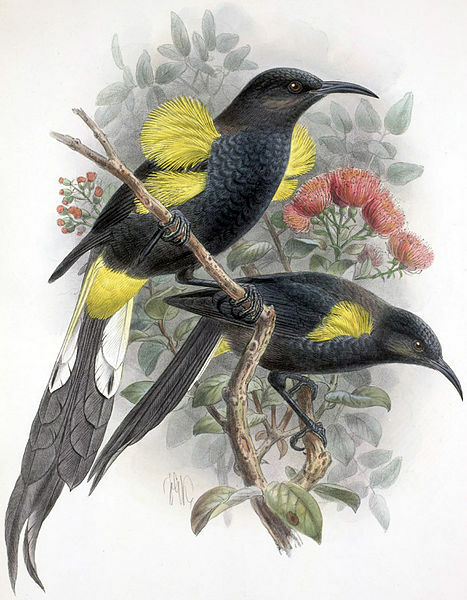 The Hawaii 'O'o was one out of four species of the Moho genus, with all members of this unique Hawaiian bird taxon having now become extinct. The last species, the Kauai 'O'o (Moho braccatus), vanished in 1987, presumably also succumbing to avian malaria and avian pox, transmitted by introduced mosquitoes (Image credit: John Gerrard Keulemans, Wikimedia Commons). A clearer case comes from Christmas Island in the Indian Ocean. Its two native rats (Rattus macleari and R. nativitatis) both succumbed within less than ten years to a trypanosome infection, transferred by fleas from black rats that arrived with the ship SS Hindustan in 1899 . Island species may generally be more prone to alien diseases for a variety of reasons, such as their evolution in relatively safe isolation and the smaller host populations. This also applies to humans living in isolation: many islanders succumbed to influenza, smallpox, tuberculosis, and measles following their first contact with European explorers, and the impact of venereal diseases should also not be underestimated. The fate of the Aboriginal people of Tasmania following European colonization at the beginning of the 19th century is known all too well. While military campaigns, forced exiles, and individual acts of violence by Europeans were certainly devastating, the main cause of their decimation seems to have been the introduced diseases . Charles Darwin (1859) proved to be right once again when he said "Let it be remembered how powerful the influence of a single introduced tree or mammal has shown to be."